OMG. Omggggg you guys. 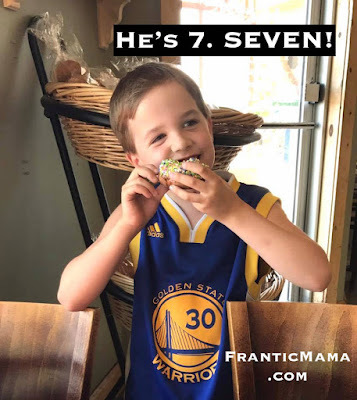 My first born turned 7-- SEVEN-- last week. My longterm, loyal [amazing] readers know I reflect every year on my son's birthday, ever since I started the blog, right before he turned 2. TWO! You know how everyone loves to inform exhausted, overwhelmed new mothers that "it goes by so fast-- enjoy every second!"? And how that 'advice' is completely annoying most of the time because if you are home all day every day with babies, toddlers, and young children the days go by anything but fast? Don't worry, I'm not one of those people. I don't have the Motherhood Amnesia so characteristic of mothers-in-law and random grocery-store shoppers. This photo courtesy of the Mother-Son date I took him on for Mother's Day. I treasure our rare one-one-one times and need to make them happen more often! I can now say that okay, yes, I see how (in a way) the years do go by fast. But not the days. Definitely not the days. I've had some doozies in my life as a mom, and I have earned each one of these 7 years (~2,555 days) as a Mom Veteran. I'm a fighter, baby! And I'm still standing. Still, I've said it before and I'll say it again this year: What my son's birthday most poignantly reminds me of is that Motherhood has brought me the greatest challenges in my life, but it has also brought me the most joy in my life. I'm forever grateful for my son. I love the person he has always been and, maybe even more, the one he is becoming. Here's to the next 7 years of Motherhood... the challenges, the joys, the heartache, the triumphs... ALL of it. Much love from me to all of you who have been with me since the beginning, and also to newer visitors. It truly takes a village-- and I don't care if it's online! You can find more of me on Facebook.